PlayBook 2.0: Will it really make a difference? Remember the BlackBerry PlayBook, the tablet that tried and failed to take on the iPad and which can currently be bought for about twenty pence and the fluff from your belly button? Well, it's back. Back! BACK! It's been a big week for mobile news, and first up was the BlackBerry DevCon in Amsterdam where betas of the PlayBook 2.0 OS were handed out. 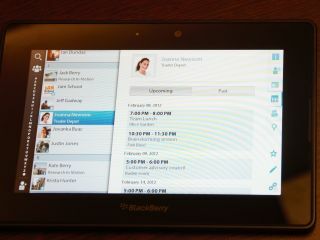 Mary Branscombe was reasonably impressed, noting that the update offers "email, calendar, contacts and remote control – but not BBM, which RIM says isn't ready yet (expect to see that later this year)" as well as "the new Cascades-based user interface [and] new messaging apps." The update makes those £169 PlayBooks sitting in your local electronics emporium look much more attractive than before, so when can you get it? Branscombe says the release is imminent - "We also expect PlayBook OS 2.0 to come out before Mobile World Congress 2012 so the announcement doesn't get lost in the crowd of other phone news." Did somebody say Mobile World Congress? This year's mobile technology showcase promises a bumper bunch of cutting-edge kit. Surely you'd have thought that would include the Samsung Galaxy S3 to be there? As Gareth Beavis says, "Well, we're pretty sure we know what's going to happen here: the Samsung Galaxy S3 is widely expected, to the point where if it DOESN'T launch Samsung is going to look pretty boring." But - o noes! - it looks like Samsung is going for the boring option: it has cancelled its MWC press conference (mind you, it's unclear if it ever scheduled one), and says that "it will still have a presence in Barcelona and will be holding new product introductions, but away from the bright lights of the big stage." We'll be there, of course, but Samsung says the Galaxy S3 definitely won't be. Samsung might not be coming, but LG promises us it'll show off a Miracle at MWC. Sadly that's Miracle in the "we've called our phone the Miracle" sense, not the "we're going to turn the boss of Samsung into a small frog for a laugh" sense. So is the Miracle miraculous? Erm, no. It's a mid-range Windows Phone handset. Nothing wrong with that, of course, but as Kate Solomon says, "we'd maybe save a codename like Miracle for something a bit more, you know, belief-beggaring, but who are we to tell LG what to do?" The most interesting bit of MWC, we reckon, will be on 29 February - specifically, between 3pm and 5pm on the 29th. That's when Microsoft is going to take the wraps off the official Window 8 Consumer Preview, which is the next big step towards Windows 8's release. We're excited about this one: Windows 8 is already looking very interesting with a range of pre-installed apps for essential tasks such as mail and contacts. Micrsoft has released full details of Windows 8 on ARM including the revelation that there will be no third-party apps for the desktop in the ARM version. We spoke to the Windows boss Steven Sinofsky to get the full skinny. As Gary Marshall explains, while Windows 8 is coming late to the tablet party, Windows 8 tablets could still be a very big deal. We know what you're thinking: all this tech news is very interesting, but when oh when will we feature Keith Harris and Orville the duck pretending to be Eminem? We thought you'd never ask. As Marc Chacksfield puts it: "Sometimes something comes along in life that's so unexpected you can barely understand just what is going on... that sound you can hear is our jaw hitting the floor."